You are here: Home / News / Get ready for the September holidays by making sure everyone is wearing an ICE Identification Bracelet! The September holidays are just around the corner, making it essential to protect everyone in the family with an ICE Identification Bracelet, Allergy Bracelet for Kids, or ICE Medical Band from ICE-TAGS South Africa. Len Nieuwoudt started ICE-TAGS on the back of personal experiences in many emergencies he encountered as part of a broader relationship developed with professionals in various medical institutes, brought about by many years in the safety and security industry. His experience with a broad range of emergency medical situations as a Security and Survival Specialist added to his sense of urgency in founding ICE-TAGS, providing easy online access to every form of ICE Identification products possible. No man is an island, and to this end, Len found a group of people as committed to saving lives as he is, backing him up in spreading the word about the necessity of being prepared for all emergencies. ICE-TAGS ICE Medical Bracelets, bands and necklaces, among other life-saving products, have all been tested in the field, withstanding all tests to produce medical emergency products that really work under all conditions. Why the focus on school holidays? There’s no doubt that emergency identification should be worn by everyone, every day, no matter what the circumstances. When parents are unable to take leave during school holidays, they have to place the safety and wellbeing of their children into the hands of childminders or extended family members. Despite the fact that parents point out any medical issues, such as allergies or other medical conditions when leaving their children in the care of others, nothing will keep your child as protected in an emergency as an ICE Identification Tag or ICE Allergy Bracelet for kids. Crowded beaches, play parks, children’s entertainment areas and shopping centres are prime locations in which a child can get lost. If your child is wearing any form of ICE Identification it will be far easier for security personnel or entertainment organisers to contact you, reuniting you and your child with minimum trauma to all. It’s unfortunate but true, South Africa has one of the highest incidents of road accidents during holidays. In the worst-case scenario, if everyone in the vehicle is badly injured and unconscious, it’s essential that emergency personnel are able to identify the victims and establish whether there are any serious medical conditions to be taken into account when rendering medical assistance. Medical personnel are trained to look for ICE Medical Information immediately, before they decide on the best emergency treatment, without causing further harm. An ICE Identification Band or Allergy Bracelet for kids is going to be the voice for any child unable to speak for themselves, giving them a fighting chance to survive an accident. 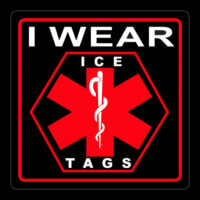 Every day is an ICE-TAGS day! Public holidays, long weekends and school holidays are not the only times ICE Identification tags or bands should be worn! Every day of the year is an ICE Identification Tag day! There are many ways in which anyone, adult or child, could be rendered unable to speak, which is when they need an ICE Identification Tag or ICE Medical Band from ICE-TAGS to be their voice. Contact the friendly, experienced team at ICE-TAGS South Africa to find out more about the outstanding range of ICE Identification tags, bands, bracelets and necklaces this offers in their dedication to saving lives! The team at ICE-TAGS would love to hear from you and will bend over backwards to make sure you’re prepared for emergencies.